Fresh air is important for all of us but when we think of clean air, we don’t think of cities. Most urban citizens, if they can, tend to flee the metropolis for the country to get a breath of it. But should this be the case? Especially when the majority of us live in cities. And fresh air is not just about what we breathe for when we seek it we are also searching for “places where our sense come alive“. This is all about our health and well-being. Having places in urban area that enliven our senses should be as integral to how we plan cities as roads and other grey infrastructure networks. In fact, we would argue that infrastructure for our health and well-being should be far more important than traditional infrastructure. Space is at a premium in urban areas. Building new parks, especially in European cities, is difficult. Yet there are acres of space, if we cast our eyes upwards, that could be utilised for our health and well-being. For high above the pavement and asphalt, there are plenty of roofs that could offer alternative green spaces. Places where ‘the air is fresh and sweet’ as the Drifters were telling us in 1962. 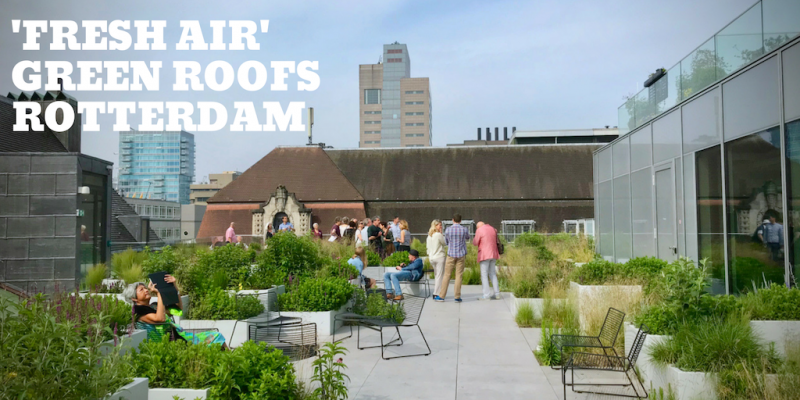 While there is a degree of evidence that green roofs can remove particulates associated with air pollution, it’s the space they provide for people that is perhaps more important. Especially with cities becoming denser. The denser the city, the less room there is for green space at ground level. Buildings make up the majority of a city’s footprint. These buildings should be the perfect platform for parks, gardens and unofficial nature reserves in the sky. In doing so, planners and developers can ensure that people – and wildlife – have access to greenery. And where there is greenery the air is likely to be fresher. Whilst “place-making for health” is a key element in the report, there is no specific mention of how green roofs could play an important role in the health of urban citizens, even though it features images of people on roofs relaxing and enjoying the air . To be fair to British Land, it has created a wide range of green roofs in its developments across London. Yet we still need planners, developers and investors to truly embrace the benefits of green space on buildings. In doing so, these spaces will contribute the health of urban citizens. 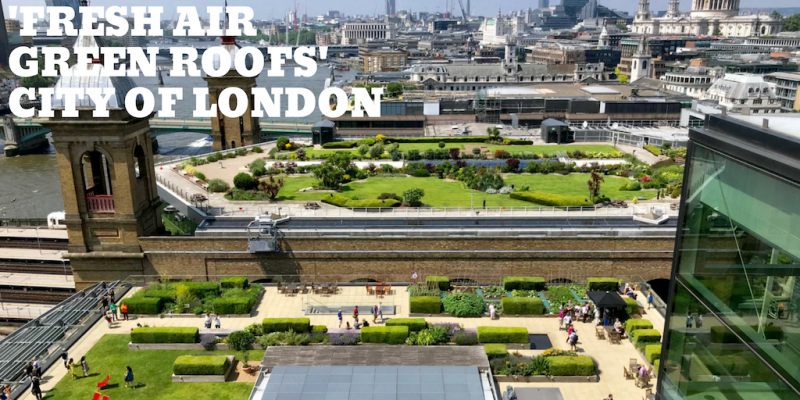 Many buildings currently with ‘fresh air green roofs’ in cities such as London, are however only accessible to the few. We also need to ensure that there is equity of access to these roofs so that all citizens, regardless of their income, can benefit from ‘fresh air green roofs’. Although most new developments over the past ten years in London have green roofs, these are only a drop in the ocean. The existing cityscape and its old roofs hold huge potential for greening. 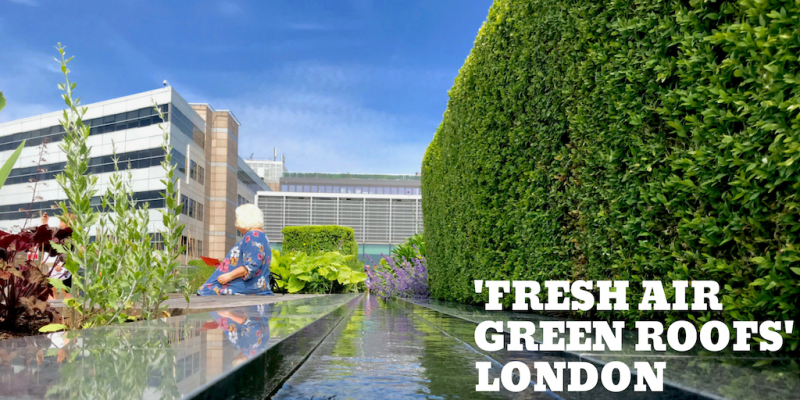 Nearly 32% of central London could be greened tomorrow (see the report we were commissioned to write for the Mayor in 2008 here). And that is just at roof level! Whilst the proportion of these spaces may not be physically accessible, many will be visually accessible from window from other buildings. We must not underestimate the visual impact of greenery at roof level on our health and well-being. So cities have a huge potential to transform themselves into dynamic green centres. Healthy roofs mean healthy citizens mean healthier buildings which also means better property portfolios for developers. Green roofs have the potential to grow value both financially and environmentally. 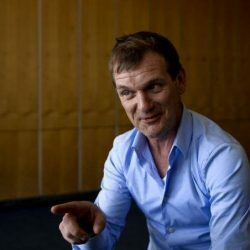 It is important, then, that any issues surrounding initial costs need to be put firmly into perspective in the light of the long-term benefits of healthier cities on their citizens. So let’s look up and away from the streets and make a greener and healthier city at roof level.